Transparency Market Research (TMR) has published a new report titled, “Physician Dispensed Cosmeceuticals Market - Global Industry Analysis, Size, Share, Growth, Trends, and Forecast, 2018–2026”. 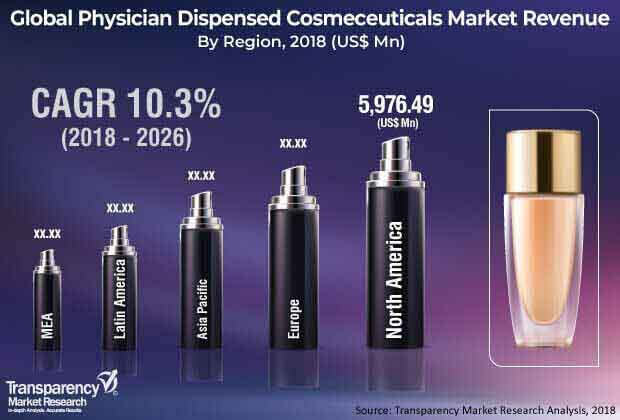 According to the report, the global physician dispensed cosmeceuticals market was valued at US$ 14,311.52 Mn in 2018. It is projected to expand at a CAGR of 10.3% during forecast period. The global physician dispensed cosmeceuticals market is anticipated to be driven by factors such as emphasis on beauty and appearance, rising awareness about anti-aging, and assurance about safety and efficacy of physician-dispensed cosmeceuticals. The physician dispensed cosmeceuticals market in Asia Pacific is expected to expand at a high CAGR of 12.0% due to changes in lifestyle and cultural attitudes, increasing pollution levels, and potential high consumer base. The region has witnessed increase in purchasing power and better exposure to international brands. Physician dispensed cosmeceuticals include medicated esthetic products that are referred by dermatologists, trichologists, cosmetic surgeons, and allied medical professionals. These products are dispensed at skin and hair clinics, beauty and wellness centers, and are available as OTC products through selected retail outlets. Increasing levels of stress, pollution, and climate change can cause damage to the skin, hair, and eyes. This has created a demand for cosmetic products to treat a wide range of dermatological conditions. Cosmeceutical companies, therefore, are developing newer and advanced cosmeceuticals to target these medical conditions. Consistent demand for advancements in skin care and beauty products is leading to exciting new entries of various products in the physician dispensed cosmeceuticals market. Various locally based cosmetic professional startups specializing in the manufacture and marketing of cosmeceuticals owned by dermatologists have recently entered the physician dispensed cosmeceuticals market in order to cater to the demand for cosmeceuticals among the local population. New entrants in the cosmeceuticals industry from developing countries include ZO Skin Health, Inc. (Japan), CU SKIN Co., Ltd. (Korea), Dr. Batra’s Skin & Hair Clinic, VLCC, and Kaya Skin Clinic (India). Hence, newer and advanced products are anticipated to enter the physician dispensed cosmeceuticals market in the next few years. Emergence of new concept of herbal medicine is paving the way for the demand for organic physician dispensed cosmeceuticals. These factors drive the global physician dispensed cosmeceutical market. The global physician dispensed cosmeceuticals market has been segmented based on product type and region. Furthermore, in terms of product type, the market has been divided into skin care products, hair care products, eye care products, injectable Botox, and others. The skin care products segment accounted for a major share of the global physician dispensed cosmeceuticals market in 2017, as the nature of cosmeceuticals demanded by consumers is largely to treat dermatological conditions. Increasing awareness about personal appearance among the geriatric population and changing attitudes of middle-aged and geriatric populations in developing countries have fueled the demand for cosmeceuticals in order to eliminate the outward signs of aging. The anti-aging segment is expected to maintain its dominance of the market during the forecast period. Similarly, dermal fillers and injectable Botox segments are expected to expand from 2018 to 2026. In terms of region, the global physician dispensed cosmeceuticals market has been segmented into North America, Europe, Asia Pacific, Latin America, and Middle East & Africa. North America is mature and technically developed, as compared to the other regions. Hence, the region accounted for a prominent share of the market, in terms of revenue, in 2017. Europe is anticipated to account for a significant share of the global market between 2018 and 2026. Surge in awareness among consumers about cosmeceuticals is expected to fuel the market in the region during the forecast period. The market in Asia Pacific is likely to expand considerably during the forecast period. Increasing preference to retain beauty and youthful appearance drives the demand for effective cosmeceuticals. These factors are expected to propel the demand for cosmeceuticals in this region. Moreover, increasing focus of key players on expansion in Asia Pacific, huge consumer base in the region, and rising awareness drive the physician dispensed cosmeceuticals market in Asia Pacific. Key players profiled in this report are Allergan plc, Jan Marini Skin Research, Inc., Johnson & Johnson, L'Oreal S.A., Procter & Gamble Co., Bausch Health Companies Inc., Unilever plc, and ZO Skin Health Inc. Companies operating in the global physician dispensed cosmeceuticals market focus on development and launch of new cosmeceutical products in emerging markets such as Asia Pacific and Latin America.